The former president remembered the late senator not as his political opponent, but as his friend. America came together Saturday to remember the late Sen. John McCain, a war hero, beloved father and proud statesman. Politicians of all stripes gathered at the National Cathedral in Washington, D.C., to pay tribute to McCain, who died Aug. 25 at age 81 after battling brain cancer. Former President Barack Obama, the Democrat who defeated McCain in the 2008 presidential election, was among those the late senator chose to speak. 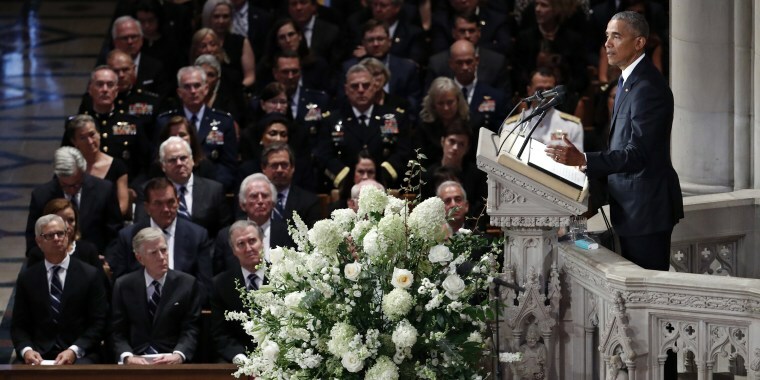 “When John called me with that request earlier this year, I’ll admit sadness and also a certain surprise,” Obama recalled to those in the cathedral pews. Obama revealed his close relationship with his colleague and the sincere friendship the two men shared. Even before Obama’s presidential victory, McCain backed his political opponent’s integrity along the campaign trail. The former president exalted McCain’s service to this country as a poignant example of all that is best in America. Obama’s tribute followed a speech by former President George W. Bush, who won the GOP nomination over McCain in the 2000 presidential race, as well as a powerful eulogy delivered by the McCain's daughter, Meghan. In closing, Obama vowed to uphold McCain's legacy by "striving to do better, to be better." "What better way to honor John McCain’s life of service than as best we can," he said. "Follow his example."